It is the self-victimization expressed in these tweets that is most objectionable. We are the victims of extreme prejudice, discrimination and oppression and this schmuck sounds like Tony Perkins with the theme that Christians are a subjugated minority. This very incident in Indianapolis is glaring proof of persecution. The very idea that LGBT people might be proud (in contrast to being ashamed) of who they are drove the business owner to abandon sound business judgment. 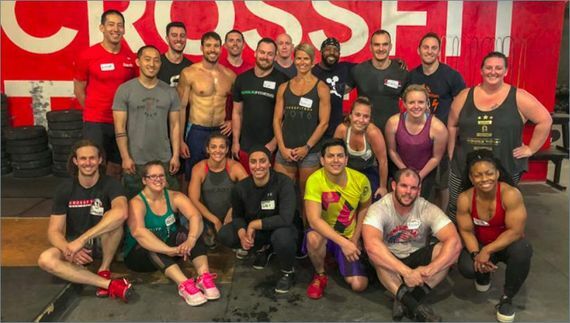 CrossFit, for their part, responded with tweets supporting the LGBTQ community and Russell Berger was terminated. On his Twitter account, Berger claimed to be CrossFit's “chief knowledge officer.” That has been replaced with Soli Deo Gloria (glory to God). Looking into CrossFit I get a whiff of cult. That aside, they told The Guardian that Berger was just a “legal researcher.” According to the Washington Post, Berger had previously been identified as CrossFit's head trainer and spokesperson. Furthermore, I found that, in 2014, the company sent Berger to Israel as part of a seminar. Would they send a mere legal researcher to Israel where he made official visits to Israeli affiliates? CrossFit lied about Berger which means that they have not accepted responsibility for Berger's actions. Moreover, Berger was a prolific blogger for the company at the company's site and also a frequent contributor to the CrossFit Journal (which, obviously, is not a journal). I can find evidence of Berger's association with the company going back to 2008. That begs another question: Over the last (at least) ten years did CrossFit not realize that Berger (out of Huntsville, Alabama no less) was a religious yahoo and homophobe? Are you going to tell me that this was the first time that the company learned of Berger's prejudices? In addition, CrossFit never trotted out an affiliate agreement which required affiliates to be inclusive. That strongly suggests the absence of any such requirement. I do not think that LGBT inclusiveness is a corporate priority. Furthermore, I can find no evidence that CrossFit was ever a corporate sponsor of any LGBT organization or event (with the caveat that absence of evidence is not evidence of absence). I have to seriously question the company's sincerity as an LGBT ally. Tweets in reaction to a storm of criticism that might damage their brand does not mean that the company is at all supportive of anything more than their bottom line. Terminating a religious zealot for abject stupidity proves nothing. Berger is being hailed as a hero and a victim of the dreaded Homosexual Agenda© in some quarters. Opprobrium over spectacular stupidity never made anyone a victim. There was no reason for Berger, as a representative of the company, to comment on this incident. He did research. He made a shopping list. He purchased the ingredients. He mixed the poison. He drank the poison. And people are supposed to feel sorry for him? Another one with LGBT ideology BS. Christian Supremacy is an ideology. Being LGBT is not but you will never convince these zealots of anything remotely similar to common sense. 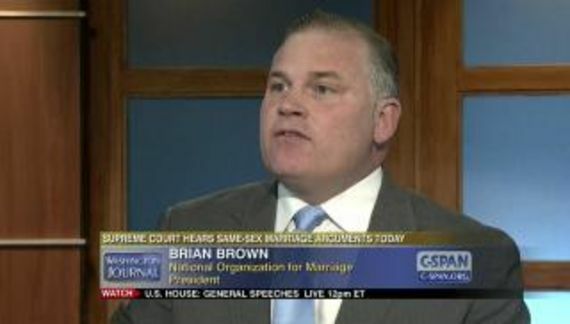 He lost his job, not for standing on principle, but for imposing his religious views on his employer. 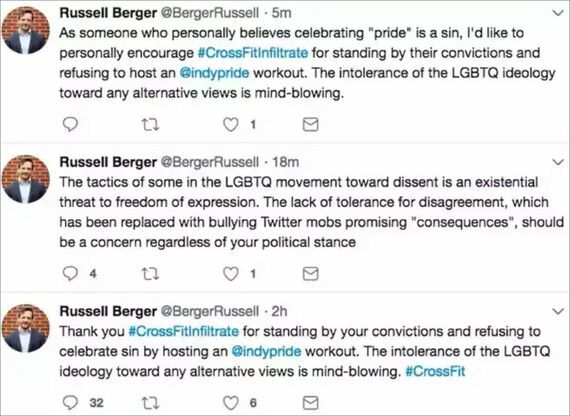 By firing Russell Berger, CrossFit has confirmed its company values align with the left’s hostility to religion, especially to the beliefs of anyone who does not celebrate the LGBT movement’s ideology. While CrossFit is a private business, the Supreme Court clearly rebuked hostility to religious expression and belief earlier this week. The employer was hostile to imbecility, not religion. Furthermore, 2nd Vote mischaracterizes the Supreme Court's decision in Masterpiece Cakeshop v. Colorado leaving nondiscrimination laws in place. What the Court took exception to was the enforcer of the nondiscrimination ordinance demonstrating open hostility to religion rather than neutrality. They were mean! This saga has produced no heroes. No victims either. A somewhat self-absorbed company protected its brand while a religious extremist has probably learned nothing worthwhile.